The new tax reform law that was signed into law on December 22, 2017, changed taxes for the majority of taxpayers beginning in tax year 2018(the taxes you file in 2019). The following infographic provides a glimpse at the impact for a typical family of four before and after the tax changes are applied. You can also check out additional infographics which will give you an example of tax law changes based on various scenarios. Below are also some of the changes to the tax law that may impact you. 2. Standard Deduction Increased: The standard deduction is increased to $24,000 married filing jointly, $18,000 head of household and $12,000 for single or married filing separately. 65 or over, blind, or disabled claiming single or head of household will get an additional $1,600 standard deduction and married filing jointly will get an additional $1,300. 3. Personal and Dependent Exemption Eliminated: The personal and dependent exemption of 4,050 per dependent in 2017 was eliminated . 4. Child Tax Credit: The Child Tax Credit for children under 17 years old is doubled from $1,000 to $2,000. $1,400 of the tax credit is refundable, which means you can still get a $1,400 credit even when you have no tax liability. The income levels when the credit phases out are increased to $400,000 for joint filers and $200,000 for others. A new $500 tax credit is available for dependents who are not your children. A Social Security number for the dependent is required to receive the tax credit. 5. State and Local Tax Deduction: The new tax law limits the amount of state and local property, income, and sales taxes that can be deducted to $10,000. In the past, these taxes have generally been fully tax deductible. 6. Mortgage & Home Equity Debt: The new law also caps the amount of mortgage indebtedness on new home purchases on which interest can be deducted at $750,000 down from $1,000,000 in current law if you already own a home. The tax deduction for interest paid on home equity loans and lines of credit used to buy, build or substantially improve the taxpayer’s home secured by their home loan is still tax deductible, but interest paid on the same loan used for personal living expenses like paying off credit card debt is no longer tax deductible. Moving expenses, except for members of the Armed Forces on active duty. Miscellaneous itemized deductions subject to the 2% income limit, such as job expenses and investment expenses. Personal casualty and theft losses, unless they are declared a federal disaster. 8. Alimony: For divorce or separation agreements executed after December 31, 2018, alimony and separate maintenance payments are not tax deductible by the payer and not included in the income of the recipient. This was not the case under prior law. 9. Health Care: The tax law eliminates the tax penalty for not having health insurance beginning in 2019. The law also allows you deduct medical expenses that are more than 7.5% of your adjusted gross income as opposed to the higher 10% if you can claim itemized tax deductions. TurboTax has you covered and will be up to date with the latest tax laws. TurboTax will ask you simple questions and give you the tax deductions and credits you’re eligible for based on your entries. If you questions, you can connect live via one-way video to a TurboTax Live CPA or Enrolled Agent to get your tax questions answered at tax-time. A TurboTax Live CPA or Enrolled Agent can also review, sign, and file your tax return. 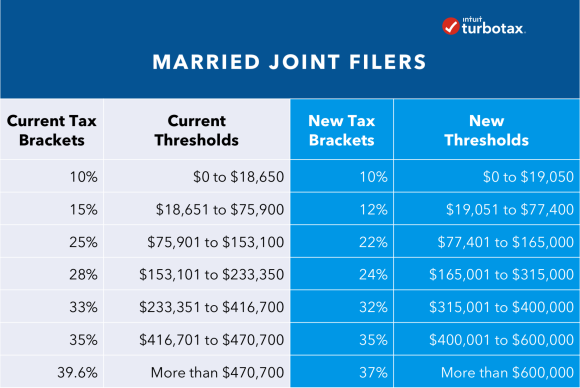 You can also check out TurboTax TaxCaster to get a side-by-side comparison of how the tax law changes impact you. Check back with the TurboTax blog Tax Reform Center Hub or with the TurboTax Tax Reform Center for more updates on tax law changes. I am filling joint and retired. My wife mad $7000, supplemental income housekeeping and we have adopted our two grandchildren one 9 one 12. and paid in $600.00 Fed. Tax. We are only getting $2300. back. Why are we not getting $2000. per child tax credit? For some reason my w-2 form says there was no federal taxes taken out and even with me claiming my son on my taxes it says that I’m only gonna get $119 something is wrong here!!?!? The tax caster gives me the correct amount for my refund with the eitc for 2018 tax reform but when i filed on turbo tax it went by last years guidelines and gave me a much different refund…im so confused. I made over $2500 and have 3 eligable children…what am i missing here. Does the eitc go down with less income? My husband left me and my kids on April but he still paying some bill and septeSept he rented the house and we moved out the country.. my question is. Can I made my taxes separately and claim my kids? Apply kids with you head of house held. Best for you sister woman. I thought the state/property tax was capped at $10,000. The example shows $17,300 for both last year and this year. Shouldn’t this year be $10,000? how does the new tax law help/hurt a divorced person that claims dependent but does not get the EIC… that now hurts the other parent? so am i no longer able to claim my mother as a dependent? My sister gave me temporary custody of her so. Can i file him? Yes it did and that’s a whole different area. The child must be your own child, a stepchild, or a foster child placed with you by a court or authorized agency. An adopted child is always treated as your own child. (“An adopted child” includes a child lawfully placed with you for legal adoption, even if that adoption is not final by the end of the tax year. )You can also claim your brother or sister, stepbrother, stepsister. And you can claim descendants of any of these qualifying people—such as your nieces, nephews and grandchildren—if they meet all the other tests. Only if he is born this year. If he’s born 1/1/19 and on, then no. Yes as long as he is here before December 31st you can claim him. My son is due in December. Do I claim him ? If he’s born by 1159pm on December 31st, you claim him for 2018 taxes. absolutely, any child birthed before midnight december 31st can be claimed for that year. If he has been born in 2018 you claim him. Evennif he is born on December 31st at 11:59 pm. If he is born January 1st at 12:01 am, you cannot claim him. Congrats. If he is born this year you I’ll put him as a dependent and his date of birth, and yes it will technically mean you claim him. Although I’m not sure you will get a full credit.. This means that even if your child was born at 11:50 PM on Dec 31, you still get to claim them as a dependent for the entire year. Yes! My son was born 12/31 and we were able to claim him for the whole year! If he is born on or before Dec 31st 2018, you can claim him. My son was born December 31. We were able to claim him on the taxes for the year he was born, even though he was born on the last day of the year.